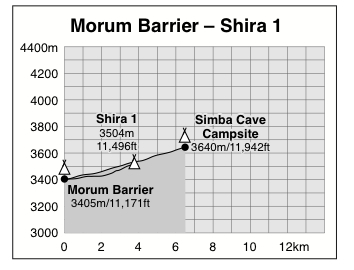 This is the older of the two trails that cross the Shira Plateau and, in our opinion, is definitely the inferior. Our problems with this route are twofold. Firstly, and in our opinion most importantly, walkers miss out on the forest zone on the way up (it’s a very rare trekker who, these days, begins their walk before Morum Barrier which lies at the start of the Shira Plateau); and it’s not just any old forest either, for the jungle on this western side of Kili is the best on the mountain. That, in our opinion, is little short of unforgivable. The second problem we have is that the Official Shira Route is actually a 4WD track used by emergency vehicles. In other words, you’ll be walking on a track that’s been designed with vehicles in mind – which can never be as fun as walking on a trail made for pedestrians; though to be fair to the companies that do offer this route, most of them these days seem to turn off the ‘road’ as soon as they can in favour of one of the many other paths that criss-cross the plateau – in effect ending up on one of the Lemosho Route variants – and some don’t actually walk on the road at all. So I guess it comes down to a matter of opinion and taste: if your sole reason for setting foot on the mountain is to get to the summit, the Shira Plateau Route may be a better route for you. But if you have any interest in the more complete experience, one that includes both ascending and descending via all the vegetation zones, then opt for Lemosho.